One of the most quickly progressing engineering types is agricultural engineering. Major advancements have been made utilizing technology (GPS, or Global Positioning Systems, specifically) to make agriculture more efficient and effective. There are also parts of agricultural engineering that overlap with other engineering disciplines - namely mechanical, civil, structural, and electrical/electronics engineering. In a nutshell, agricultural engineering involves applying more traditional engineering principles previously mentioned – mechanical, structural, technology, etc. – to agriculture, with the goal of reducing farmer/operator fatigue, gaining efficiency, being more environmentally friendly, and designing and building equipment. The below video shows highlights of Iowa State University’s Agricultural Engineering program, interviewing current and former students about what the program entails, and gives a good video overview of exactly what agricultural engineering is. Agricultural engineers focus on the large-impact areas of agriculture. As with most engineering sub-disciplines, there are very specific areas where students can specialize. We have noted some of the most common and most progressive below. Some typical areas of study include the design of agricultural equipment or structures (overlap with mechanical and structural engineering). Major advancements have been made in this area, especially with equipment. Large-row planters and automated driving and steering by many farming equipment companies are several mechanical advancements made with agriculture. Bio engineering is a very quickly advancing industry, and a hot-button topic for many people when it comes to food engineering and genetically modified organisms. However, engineering different crops’ genetics to be able to use less pesticides, be pest resistant, or to more quickly and efficiently farm crops is a growing concept for most countries, especially third world countries. Biotechnology has also made advancements, such as producing pharmaceuticals, such as human insulin for diabetics and medicine to treat numerous diseases. Especially with large-farming companies, there is quite a bit of animal waste and chemical runoff. There are overlaps with environmental and sustainability engineers, where they work together to create the most environmentally friendly solution while being efficient for the farm. There is a lot of science and math that goes behind deciding how to use parcels of land. Crop rotation is not quite as common in some places as it used to be 50 years ago, but figuring out how to allocate land and water is important in trying to reduce the amount of chemicals and other resources farmers need to use, which reduces cost. Perhaps one of the most fascinating areas of agricultural engineering is agricultural technology. As we previously mentioned, GPS has allowed for many technological advancements within agriculture. Precision agriculture is probably one of the biggest industries that has grown over the past decade. Precision agriculture optimizes land to perform with limited amounts of chemical usage. Additionally, it reduces overspray and over-seeding to reduce costs, and helps use big data to better understand the optimal time to plant. The below video gives a nice summary of precision agriculture from a high-level viewpoint. The American Society of Agricultural and Biological Engineers (ASABE) is an international society specifying in agricultural and biological engineering, and has thousands of members represnting over 100 countries. It would be a good idea to check them out if you are considering an agricultural engineering career. 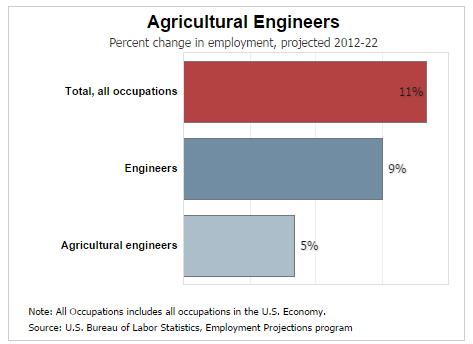 Agricultural engineers – as with most engineers – make more than the average career. 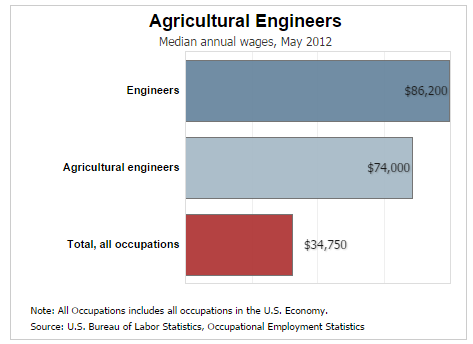 However, at around $74,000, agricultural and biological engineers do tend to make less on average than other engineers. Although agricultural engineering has grown the past decade, many think it has plateaued for a bit, including the Bureau of Labor Statistics, which is is projecting 5% growth over the next 10 years, slower than average.